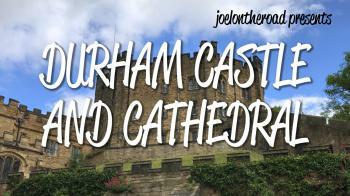 Durham Castle and Cathedral are the largest and most impressive examples of Norman architecture in England. They overlook a bend in the Wear river, crossecting the old university town of Durham. The Cathedral was built between 1093 and 1133. 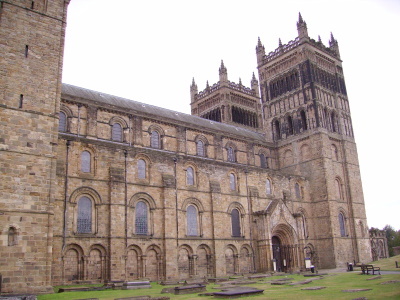 It is in the Norman (Romanesque) style, and houses the relics of St. Cuthbert, the evangelist of Northumbria. The building is considered one of the high points in medieval architecture, because of the speed in which it was made (about 40 years) and the considerable unity in its style. Most spectacular is the Nave with the huge carved pillars that are 6.6 metres round and 6.6 metres high. Behind the Cathedral, at the northern end of Palace Green, is the Castle: an ancient Norman fortress which was the residence of the Prince Bishops of Durham. The first view of Durham, from the train or walking down from the railway station, is very impressive. The town is dominated by what looks like a huge fortress; in fact it is the medieval complex of cathedral and the castle. Quite hard to encapture this sight into a picture, though. I climbed bridges and followed the riverside footpath, but to no avail. The front of the Cathedral is massive, but the whole thing is huge when you look at it from the side. The grey stones also dominate the inside, giving it a heavy air although the pillars are distinctly decorated. Somehow, I didn't find the time to go inside the castle. There are guided tours a few times a day, but I preferred sitting on a bench, reading a book, sipping some coffee, and looking up every ten minutes or so to enjoy the magnificent architecture. March 2018 - Wow, what a cathedral. We walked one hour through the cathedral and one of the guides told us about the history of the building and we discovered a lot of details. There are even mauric influences, which can be seen in the pillars of the church. We also got to hear a short concert on the organs. Amazing acoustics. The university, and the area around the cathedral is very authentic and historic. The Tourist information has a detailed exhibition on WHS. Very interesting town and good for a stopover from Newcastle to the south. My wife and I visited Durham Castle & Cathedral in June 2017. I actually found this site to be quite a disappointment. The cathedral is impressive, but I didn't think it was more impressive or interesting than York Minster which isn't on the UNESCO list. Likewise with the castle, most of it is actually comparatively recent in construction - the beautiful keep is actually from the 18th century, and the buildings around the main square are mid-1600s. Only one small Norman chapel survives from the earliest days of the castle. Also very disappointed to find that neither the castle nor cathedral allowed photography or filming inside, which makes producing a video review a very difficult task! Prior requests to the management for a permit went unanswered. Overall unless you have a specific interest in this area or either of the buildings, I wouldn't recommend it over say York or Oxford. I visited this WHS in June 2016. I slept 1 night here on the day the Brexit referendum voting took place and as much as I loved the vibrant feel of this university town and the magnificent views of the castle and cathedral from the banks of the River Wear, I wasn't that much impressed about its OUV. Unfortunately, I think it doesn't rank as one of the best European cathedrals on the list so I'm glad I spent more time visiting another site of the Frontiers of the Roman Empire and only dedicated a late evening and a morning visit inside the cathedral. I felt the castle doesn't add much to this inscription and it isn't impressive either. I enjoyed my free visit at the Durham WHS Visitor Centre (open 09:30-18:00) but I cannot understand why photography is not allowed in the Cathedral during normal hours while it is permitted on special Thursday night tours. Probably a source of income for restoration I hope, but it would make much more sense to be able to pay to take photos any time and not only on a particular day of the week. If truth be told, there's nothing that special inside apart from the Norman elements of the cathedral. My highlight in Durham was eating a delicious fish & chips with mushy peas in the main square from the popular Proper Fish & Chips Restaurant. Had I more time, I would have loved to meet up with Solivagant for some insider tips but I hope to make up for that in Vilnius at least. Now I can fully understand why he would choose York and Whitby over some of the nearby WHS. I spent a year studying at Durham U when I was young. Each day I would walk through the cathedral and along the riverbank to admire the view of it from there. When I revisited the cathedral several decades later I felt the same mystical sense of its beauty as before. Only Chartres, of many other beautiful cathedrals I have seen In Europe, has a similarly powerful aesthetic effect on me. I agree with the other reviewers about the amazing view of the cathedral and castle from the train station that builds your excitement about the town as you arrive. Similar to other viewers, the skyline view of Durham from the train station was indeed very gorgeous, the whole complex of cathedral and castle, a World Heritage Site, on the top of the hill perching above the city really made Durham looked very special and unique. From the rail station, it was very near to reach the old city center. At first I decided to walk along the river to see the breathtaking view of the Cathedral, the only word came out from my mouth was "WOW", the view of gigantic medieval structure behind the forest with the reflection on the river was truly postcard perfect. Then I continued to the old city which was part of University of Durham, after some direction confusing to find cathedral entrance, I finally reached my destination, the Cathedral Church of Christ, Blessed Mary the Virgin and St Cuthbert of Durham or shortly Durham Cathedral. Inside the cathedral, I was impressed by its sacred atmosphere; the beautiful and unique columns along the central nave were indeed one of the highlight, but the superb workmanship of choir and organs won my heart. I also saw the tomb site of St Cuthbert behind altar and very simple tombs of the Venerable Bede in Galilee Chapel, two holy men of Northern England which signified the importance of this Cathedral. After Cathedral, I went to see the cloister, which nothing was special; however the modern cafeteria and cathedral museum shop were surprisingly bright and warm, no wonder why this area was so popular with the tourists. The Cathedral was free of charge but 5 pound donation was highly appreciated. During my visit the cathedral received a continuously flow of tourists and university students and maybe fan of Harry Potter film. After saw many UNESCO listed cathedrals, I hardly found a nice cathedral which really can impressed me in the last few years, Durham was truly a breeze of fresh air for me, this cathedral was quite unique enough for its own, the interesting Norman influence was lovely to admire especially at columns in central nave and inside the Galilee Chapel. The only regret was photo was not allowed inside and that such a great tragic that how much you can remember all those beautiful details inside the complex. What wonderful memories I still have of my time in Durham! I was lucky enough to live the the keep of Durham Castle for four weeks in July 1970 with AIFS. Can you imagine the magic of celebrating my 18th birthday in a castle?? Treasured times, treasured friends. I lived and worked in Durham for 3 years. I have been away from it now for over 13 years, however when ever I get the chance I go back to visit. I was there yesterday (31st January 2010) for a short while introducing it to a dear friend. It holds special memories for me, the Cathedral is magnificent and the position of the city is superb. Its peace, tranquillity and spiritual ambience makes it one of my favourite places in England, steeped in history, it truely is a magical place which as a Northener I was proud to show to my dear friend. Durham had been on my list of sites to see soon for some time and in March 2009 I finally managed to arrange a work trip that enabled me to see it. I have to say I am in agreement with most of the other reviewers on this page, Durham really is a lovely place to visit. I got my first view in the morning as my train travelled across the viaduct. It was quite a surprise just how impressive an entrance to the city this was, certainly one of England's finest urban views. I managed to get back in the afternoon to explore the city on foot. The town centre is a nice maze of winding roads and narrow alleyways. The approach up to the Cathedral green was particularly nice. I was very lucky as when I went into the cathedral there was a choir practice being conducted, this really added to the atmosphere. I must admit to sometimes having cathedral fatigue as collecting World Heritage Sites takes you to a lot. However I really enjoyed visiting the interior, it was not particularly busy and also it was free to enter, a bit of a rarity in England. The famous columns with diagonal patterning were very impressive. Also it is well worth heading through the cloister to the bookshop and restaurant, which are housed, in some fine outbuildings. Alas, the castle was closed for a special event when I visited, it did look impressive but I am not sure I would have ventured in had I had the option. I just enjoyed the views of it from the river. I visited after a meeting in Newcastle (about 15 minutes by train), which I was particularly impressed with. If you are in the area it seems like a great place to be based. I should hopefully be back up there to visit Hadrian's Wall, and certainly would have no qualms about going back to Durham to explore a little more of one of England's most charming cities. A very worthy World Heritage Site. I have visited the Cathedral twice, and it is hard to describe the overwhelming positive feeling that I felt when I observed all the building details . It is a masterpiece , beautifull. I planned to come back, God willing. The sight of Durham cathedral from the train means to the people of County Durham and Tyne & Wear that we are home. The cathedral is a fantastic piece of architecture. Very atmospheric as you walk around the place and when the chior are signing in the practice room it echoes around the halls. Durham cathedral is truly a superb building. I last visited there about twenty years ago and I'm ashamed to say that I had forgotten how wonderful it really is. It's certainly true to say that you dont appreciate what you have on your own doorstep. The only thing that is disappointing is that whilst there is a copy of the Lindsfarne Gospels held within the cathedral the original is kept in London ( a place as far away from Lindisfarne and the history of this area that you could wish to get) miles away from its true beginnings , what better place for anyone to view this holy book than in the area in which it first began. 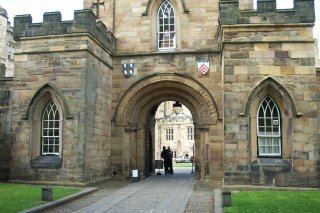 I was blessed to have lived in Durham Castle for four weeks as part of an AIFS group in the summer of 1968. It is truly one of the highlights of my life and I have such fond memories of the Castle, as well as the Cathedral, Durham University and the townsfolks of Durham. I hope to return for an extended visit in 2010. I brought my seven year old son to visit the Cathedral and the Castle. Hav to say it is absolutely spectacular and is breath taking. When you sit back and consider the work that has gone into the Cathedral during such hard times it makes your mind boggle! Fell in love with the place and I felt a sense of warmth and calm that I have not experienced anywhere else yet. You are truly lucky people to live in such a beautiful part of the country! 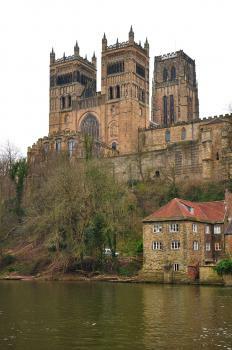 Durham cathedral is beautiful structure that casts its reflection into the river Wear in the heart of the city. The cathedral truly deserves World Heritage status. I am fortunate to live and work in Durham, too often people take for granted what is on their doorstep. Whenever I am in the city I take my camera to record more views of this spectacle. I am looking forward to visiting the cathedral again in 2007 to get more images and stories for my website. As an American who has moved to Durham, I found the history of Durham, which is incorporated in almost every aspect of life, amazing. The idea that people had been here for thousands of years, and that some of those people built magnificient buildings such as the the cathedral was exhilarating. You never know what you've truly missed before unless you experience a different way. Like the other posters, I really enjoyed Durham. Even though I had arrived in the early morning on a night bus from London and had to wait several hours for anything to open, the city didn't fail to impress me with its considerable charm. The cathedral is one of the greatest in England, and a wonderful example of Norman architecture at its prime. The castle is also very interesting, but it's now used as a university, and not everything can be seen. By the way, when I was there, the late Peter Ustinov was still chancellor (or whatever his exact title was). I found this entertaining, even though the post is probably only ceremonial. 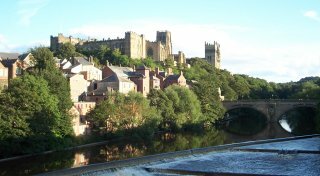 The city of Durham is also pleasant and not too big, meaning that the cathedral and the castle can be seen from almost anywhere, without any modern buildings blocking the view. I always found that the castle and cathedral are enchanting, even though I live close, and when I visit it's like a trip into a world from the past. i live next to Durham castle and cathedral and they are both magnificant but you do not appreciate them when you live so close to it. It is a magnificant place with a magnificant history. Durham cathedral is a lovely place to ralax at night when the lights shine up at the cathedral the scene is unberliveble and is breath taking.The sight is not only breath taking but is a memory which will last a life time i would recomend a visit to durham cathedral to anybody who is interested in historicsl sights. Durham is truly a jewel in the English Crown. I would urge anyone to experience this historical city as it truly is magnificent. All previous examples of Norman architecture such as ELY cathedral in Cambridgeshire, have been put to shame by this cathedral. At night the views from across the river are breathtaking and, following on from Sir Walter Scott: 'This view is unsurpassed in England'. I really enjoyed my visit to Durham Castle and Cathedral. I took a tour of the Castle and i found the history fascinating. 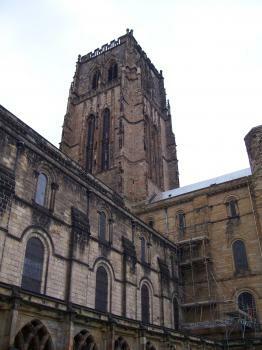 The Cathedral was really impressive and i climbed to the top of the tower to get a good view of Durham city. Everywhere I went in Durham, i never lost sight of the castle and cathedral. they dominate the city and are a really historical background. 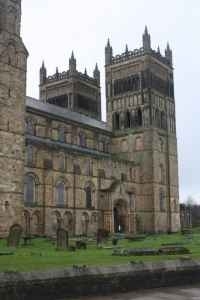 Fortified religious buildings: Cathedral: "Durham Cathedral was also partly fortified and known as 'half fortress against the Scot'." 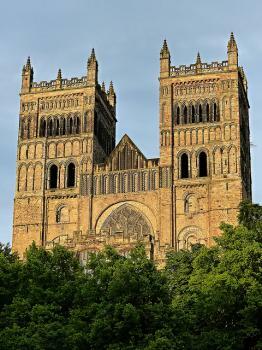 Benedictines: "Durham Cathedral was founded as a Benedictine Foundation and remained as such until the Reformation."